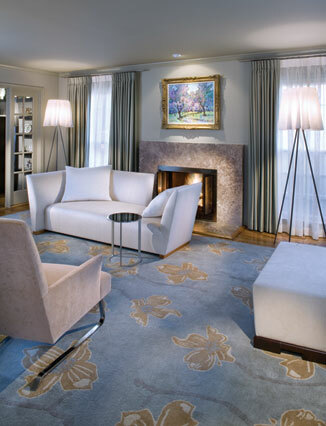 In the living room Santalla designed a custom rug and a new marble fireplace surround. Some of the best designs are borne out of necessity. Such was the case when homeowners with two children called on Ernesto Santalla, an architect who specializes in interiors, to renovate three second-floor bathrooms—all of which were plagued by leaks. Santalla updated them in a clean-lined, modern style, enlarging the cramped master bath by “borrowing” space from an existing closet. His clients were so pleased with the outcome that they asked Santalla to refurbish their master bedroom and remodel their basement. A few years later, the homeowners called him again, this time for a more ambitious project: to renovate the main floor of their Colonial-style home. Its typical 1970s layout consisted of a center hall leading to a living room and library on one side and a dining room, kitchen, den and laundry area on the other. 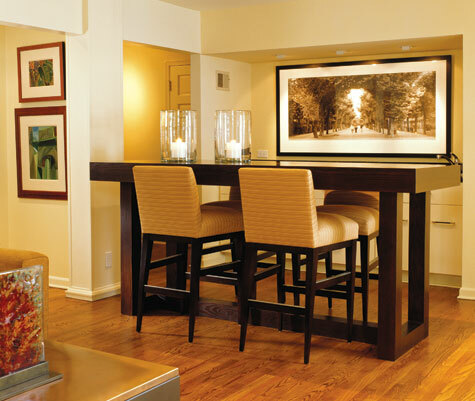 The homeowners wanted more space and better flow for entertaining, but had no idea how to achieve these goals. The seating is Donghia and floor lamps are Philippe Starck for Flos. 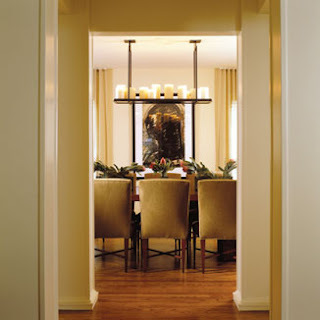 From the original foyer, guests could see through the dining room and the kitchen all the way to the door to the garage—a less than optimal view. Beyond the dining room, a corridor led to a den that was “out of sight, out of mind,” as Santalla recalls. Another corridor separated the den from a small laundry room. The architect’s solution opened up the small rooms and created a sleek, polished look throughout. His first move was to widen the corridor leading from the foyer to the kitchen and construct columns on both sides. This “loggia” opens to a new family room, which was created by removing the walls separating the original den and utility room. The loggia also leads to the kitchen, allowing Santalla to eliminate the passage from the dining room to the kitchen and in its place create a focal wall for artwork. One side of the family room houses a large custom table (top) that the owners use for casual dining and work. 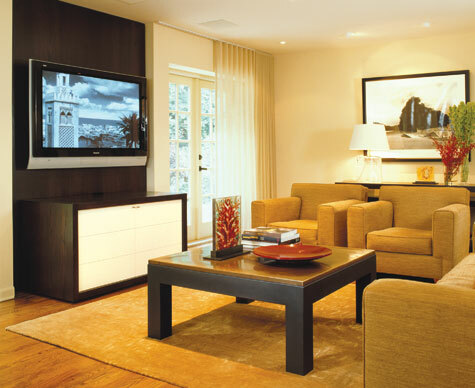 A subtle color palette of golden tones creates a cohesive transition from room to room. 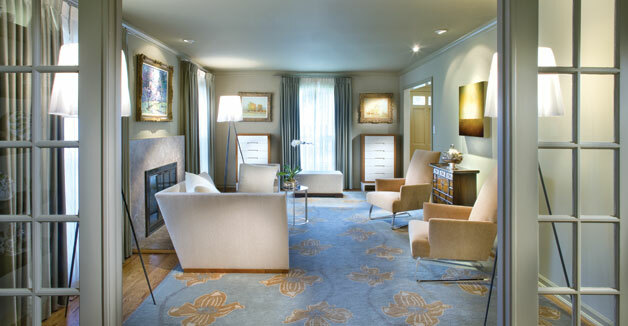 Santalla helped his clients select furniture with clean, simple lines, blending timeless, modern pieces from Donghia and Holly Hunt with the couple’s own antiques and art. The “soup to nuts” upgrade also included a new lighting plan for all of the main-floor spaces. In the living room, a slightly more feminine look prevails. The Tibetan carpet of Santalla’s design is based on a motif he sketched of magnolia leaves. “We were very conscious about mixing traditional and modern elements in this particular room,” he says. He designed contemporary cabinets to store his clients’ silver collection and paired them with traditional paintings, while hanging abstract art above antique chests. The other side of the family room houses a comfortable seating and media area. The living room opens to the wife’s home office, where she displays rare china inherited from her mother. In lieu of “old lady curio cabinets,” Santalla chose modern shelving from BoConcept and an armoire to offset the collection. He reupholstered a pair of Barbara Barry chairs so they would complement the new look. 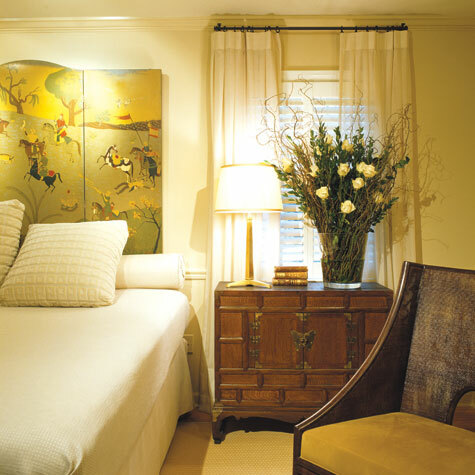 The master bedroom displays the owner’s Asian antique screen in lieu of a headboard. 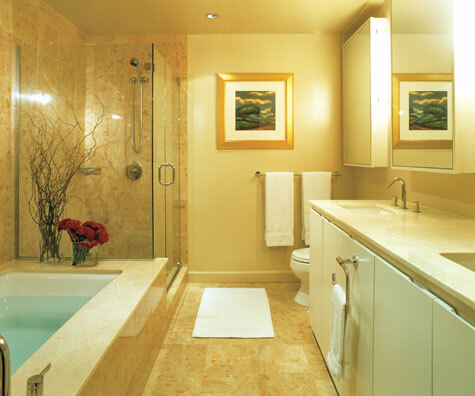 The project all started when Santalla was hired to renovate the couple’s master bath.